Mobile operating systems space is currently dominated by Android and iOS with Windows Phone still a new entrant and a long way to go before it can pose a threat to Android or iOS. Blackberry is still to come with something great with its Blackberry 10 launch and Symbian is already dead. Even with all these, a new Mobile operating system Firefox OS backed by Mozilla is soon going to enter this war of Mobile operating System. Â But do we need another mobile OS? who knows as even when Google Chrome came as a new browser, many of us said that we we need another browser. But we all know, Chrome is the most popular browser now on the web. Firefox OSÂ is a new mobile operating system built entirely using open web standards. In Firefox OS,Â HTML5Â apps can do â€œphone thingsâ€ â€“ they can make the phone vibrate, make a phone call or send a text message. 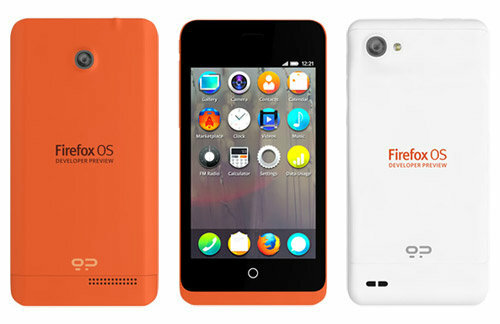 Mozilla has announced today the debut of twoÂ Firefox OS developer preview phones to be made available in February,Â developed byÂ GeeksphoneÂ in partnership with Telefonica and Geeksphone. The two phones are named asÂ The Keon model andÂ The Peak model. Both of these phones are powered byÂ Qualcomm Snapdragon processors with modest 512 MB RAM. Â Checkout specifications of these phones below. Screen 4.3â€³ qHD IPS Multitouch. Even though the public release of Firefox OS is still almost a year away, but we would love if it can challenge Â the existing mobile operating systems and can come out as a great alternative.